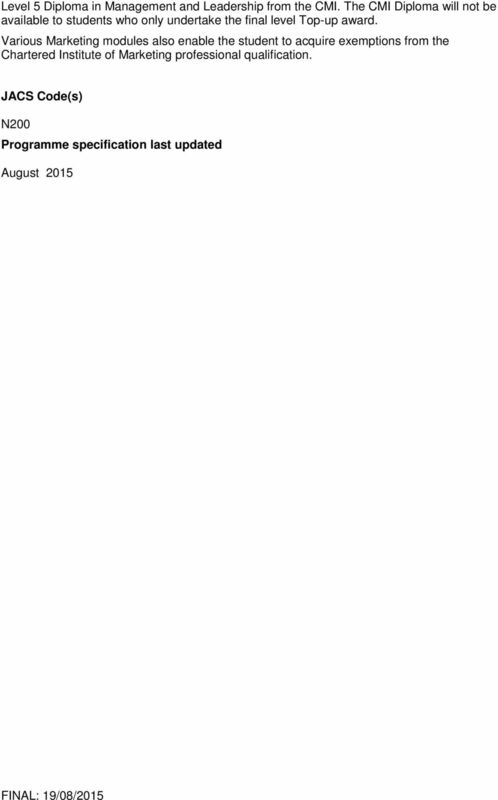 Download "College of Business. 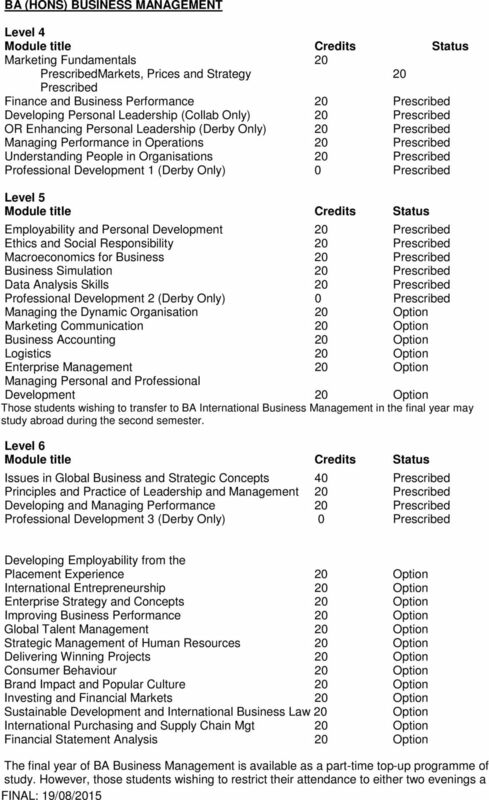 BA (Hons) Business Management. Programme Specification"
4 SECTION TWO: OVERVIEW AND PROGRAMME AIMS OVERVIEW This programme is designed for students with an interest in business, who wish to gain a thorough grounding in all business disciplines rather than specialise in one particular area. Students choosing the BA Business Management tend to aspire to a corporate career, often in larger companies. A graduate with a BA Business Management should be very well placed to enter almost any sphere of the business world. There is particular emphasis on real life business situations as these are essentially practical degrees. Graduates from this programme of study should be etremely employable. The involvement of the Chartered Management Institute in the design, accreditation and delivery of the programmes should give students a leading edge over others studying the same or similar degrees at benchmark institutions. The dual accreditation should make their CV stand out from the crowd and appeal to prospective employers. 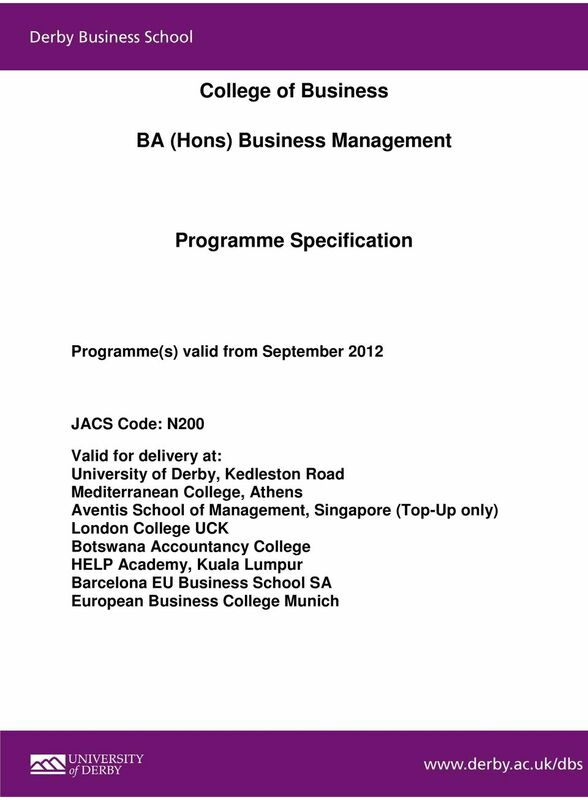 The BA Business Management programme is largely prescriptive in nature with relatively few options. 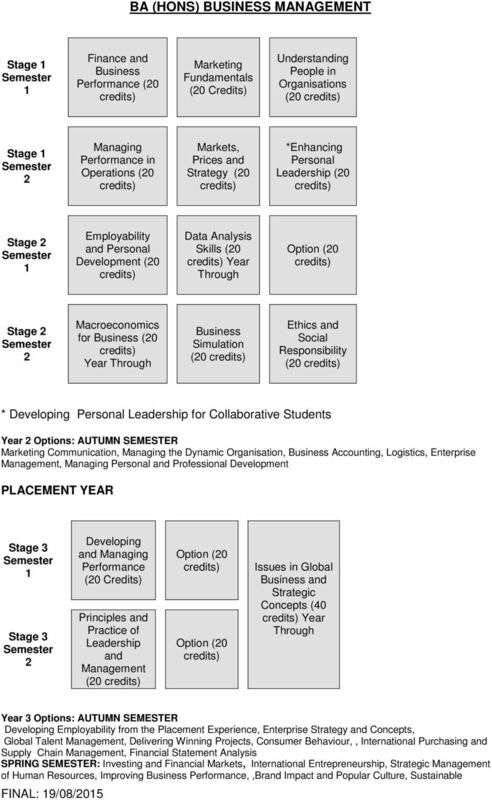 This is a direct consequence of matching of modules with the CMI Diploma to achieve dual accreditation for those students who successfully complete all three taught years of the Programme PROGRAMME AIMS The programme aims for each programme within the Undergraduate Business Programme scheme consist of generic aims common to all programmes, which are then supplemented by programme specific aims. 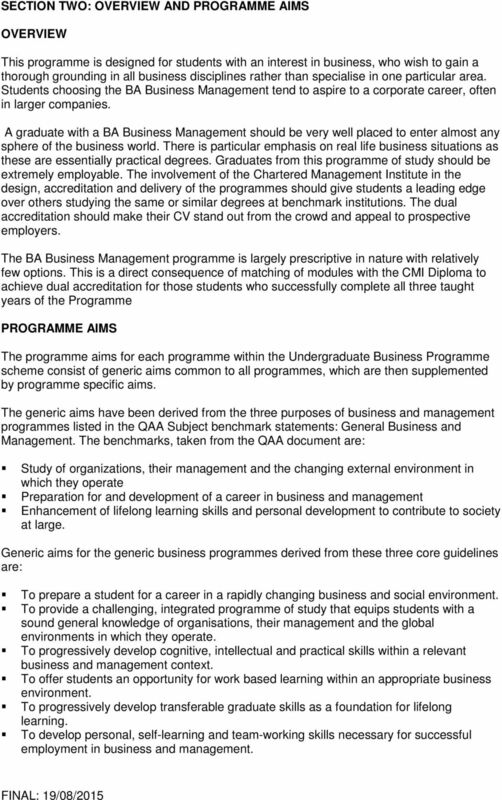 The generic aims have been derived from the three purposes of business and management programmes listed in the QAA Subject benchmark statements: General Business and Management. 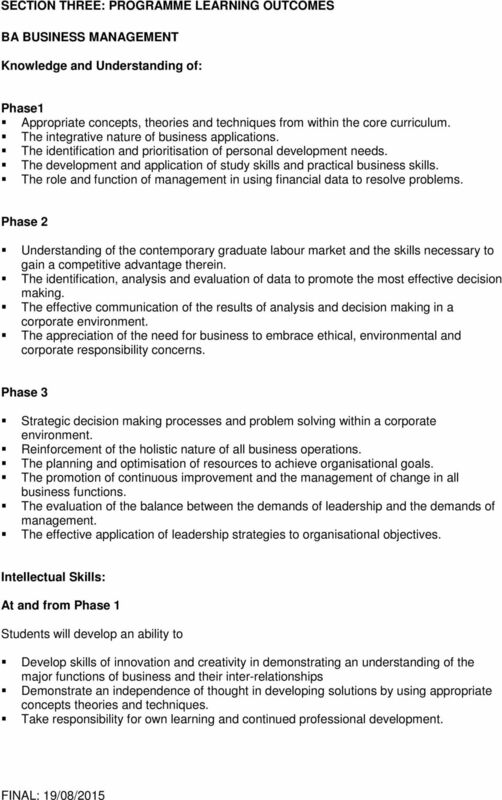 The benchmarks, taken from the QAA document are: Study of organizations, their management and the changing eternal environment in which they operate Preparation for and development of a career in business and management Enhancement of lifelong learning skills and personal development to contribute to society at large. Generic aims for the generic business programmes derived from these three core guidelines are: To prepare a student for a career in a rapidly changing business and social environment. To provide a challenging, integrated programme of study that equips students with a sound general knowledge of organisations, their management and the global environments in which they operate. To progressively develop cognitive, intellectual and practical skills within a relevant business and management contet. To offer students an opportunity for work based learning within an appropriate business environment. To progressively develop transferable graduate skills as a foundation for lifelong learning. To develop personal, self-learning and team-working skills necessary for successful employment in business and management. 5 The Business Management degree offers a broad business background with the opportunity to pursue some element of specialisation in the latter stages. The degree has been developed in close consultation with the Chartered Management Institute (CMI) and will be one of the very few undergraduate courses in the UK offering a dual award. 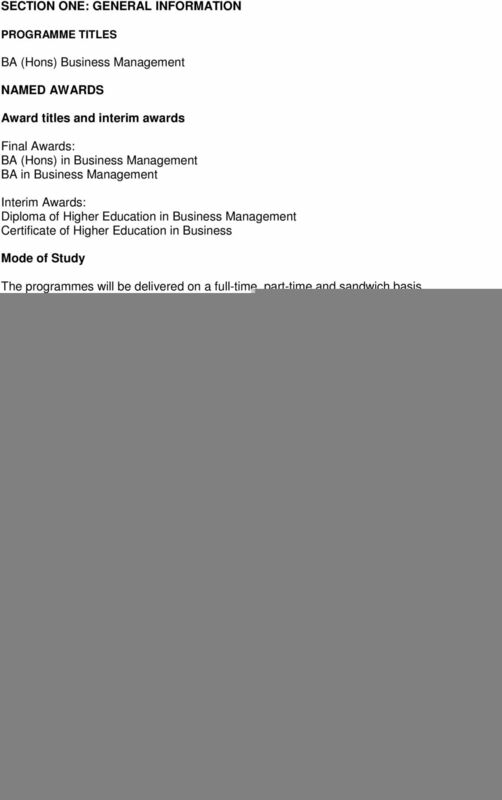 Without studying any additional modules, students completing all three taught years of the BA Business Management will also receive a Level 5 CMI Diploma in Management and Leadership. Students will benefit from involvement with the CMI and prominent employers who will provide guest lecturers, visits, provision of case studies, attendance at local CMI events and the consequent opportunities for networking. The linkage of academic discipline to practical scenarios will make the programme vocationally relevant and enhance student employability. Skills modules have been introduced at each level of study as well as integrative modules which use business games, case studies or actual work eperience. The aim is to produce a well rounded graduate who will be eminently employable. The linkage of academic discipline to practical scenarios will make the programme vocationally relevant and enhance student employability. Those without current or previous work eperience will not be disadvantaged as the integrative modules at all levels are intended to unite all business disciplines in as realistic a scenario as possible. 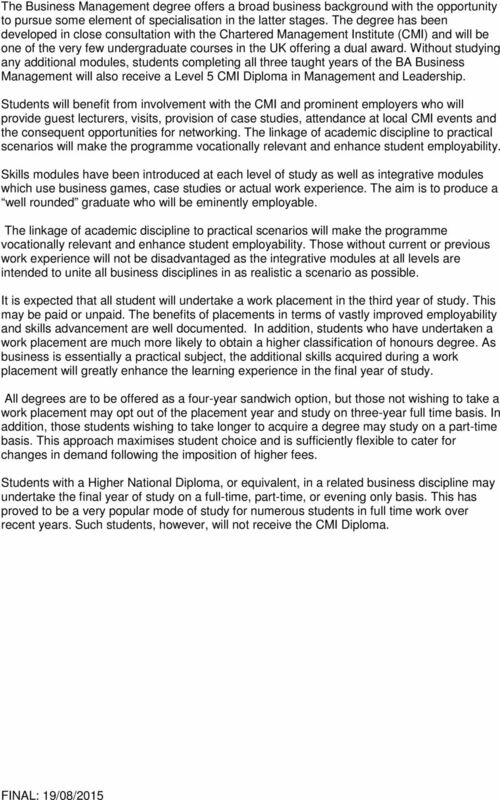 It is epected that all student will undertake a work placement in the third year of study. This may be paid or unpaid. The benefits of placements in terms of vastly improved employability and skills advancement are well documented. In addition, students who have undertaken a work placement are much more likely to obtain a higher classification of honours degree. As business is essentially a practical subject, the additional skills acquired during a work placement will greatly enhance the learning eperience in the final year of study. All degrees are to be offered as a four-year sandwich option, but those not wishing to take a work placement may opt out of the placement year and study on three-year full time basis. In addition, those students wishing to take longer to acquire a degree may study on a part-time basis. This approach maimises student choice and is sufficiently fleible to cater for changes in demand following the imposition of higher fees. Students with a Higher National Diploma, or equivalent, in a related business discipline may undertake the final year of study on a full-time, part-time, or evening only basis. This has proved to be a very popular mode of study for numerous students in full time work over recent years. Such students, however, will not receive the CMI Diploma. 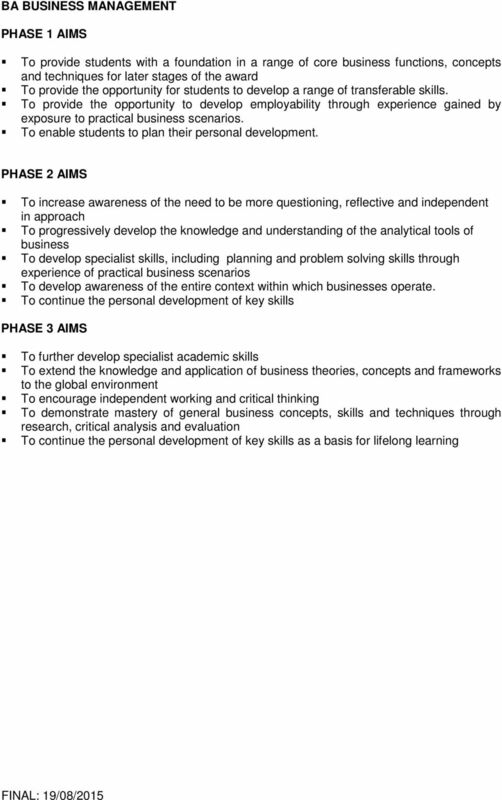 7 SECTION THREE: PROGRAMME LEARNING OUTCOMES BA BUSINESS MANAGEMENT Knowledge and Understanding of: Phase1 Appropriate concepts, theories and techniques from within the core curriculum. The integrative nature of business applications. The identification and prioritisation of personal development needs. The development and application of study skills and practical business skills. The role and function of management in using financial data to resolve problems. Phase 2 Understanding of the contemporary graduate labour market and the skills necessary to gain a competitive advantage therein. The identification, analysis and evaluation of data to promote the most effective decision making. The effective communication of the results of analysis and decision making in a corporate environment. The appreciation of the need for business to embrace ethical, environmental and corporate responsibility concerns. Phase 3 Strategic decision making processes and problem solving within a corporate environment. Reinforcement of the holistic nature of all business operations. The planning and optimisation of resources to achieve organisational goals. The promotion of continuous improvement and the management of change in all business functions. The evaluation of the balance between the demands of leadership and the demands of management. 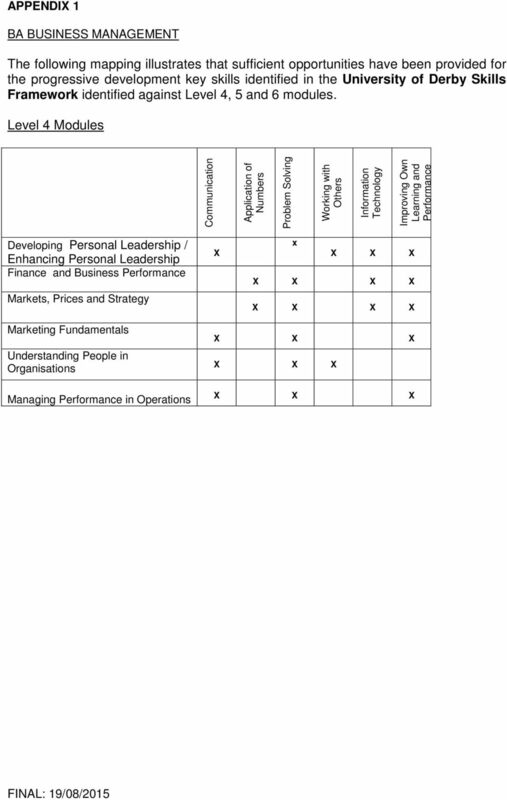 The effective application of leadership strategies to organisational objectives. Intellectual Skills: At and from Phase 1 Students will develop an ability to Develop skills of innovation and creativity in demonstrating an understanding of the major functions of business and their inter-relationships Demonstrate an independence of thought in developing solutions by using appropriate concepts theories and techniques. Take responsibility for own learning and continued professional development. 8 At and from Phase 2 Analyse, synthesise and interpret business data. Apply theoretical concepts to practical business situations. Adopt a holistic approach to the study of business and subject related areas. At Phase 3 Critically evaluate theories, strategies and plans. Develop skills of creativity and self-reliance. Demonstrate an independence of thought in developing solutions to a range of business related problems. Subject Specific Skills: At and from Phase 1 Students will develop an ability to Access, use and interpret data from a range of business sources. Use appropriate terminology, concepts, theories and techniques within a variety of contets Apply business knowledge and skills to a work related learning situation. At and from Phase 2 Develop and make use of appropriate interpersonal skills necessary for a career in business. Continue to apply knowledge gained to a practical environment, thereby developing observational and analytical skills. At Placement Phase Apply their business knowledge and skills in a work based learning situation. At Phase 3 Ehibit correct referencing and bibliographic skills when presenting the solutions to a variety of practical business scenarios. Show the capability of treating all aspects of business as a whole rather than as separate disciplines. Transferable Skills: At and from Phase 1 Students will demonstrate an ability to Communicate ideas effectively, both orally and in writing. Manage time and work to deadlines. Use information technology to retrieve, analyse and present data. Work effectively and constructively as part of a group. Work independently, demonstrating self-direction. Self-appraise and reflect on the application of theory to practice. 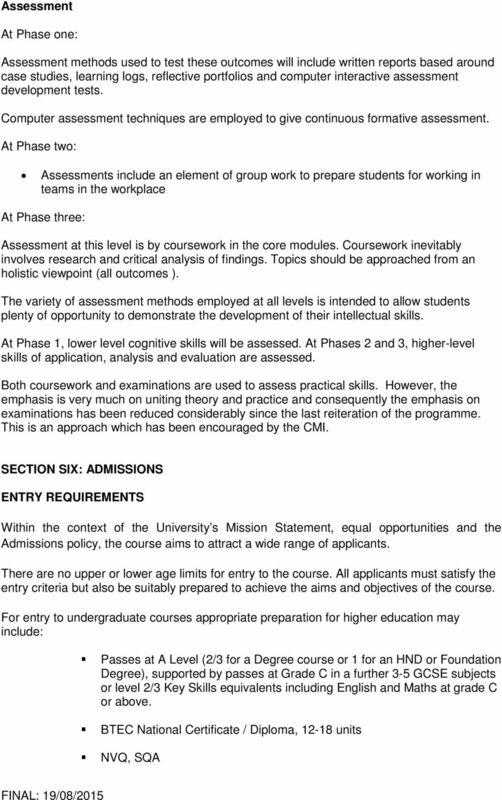 9 SECTION FOUR: PROGRAMME STRUCTURE Structure and Curriculum The programmes are studied on either a full-time or part-time basis. The modules that make up the programme have particular importance in your preparation for the world of work. We have chosen the modules so that the programme outcomes are developed. You will see that there is also a small range of options to match your own study need and interests. What we term a Curriculum Map is appended to this programme specification so you can see how the programme outcomes and modules interrelate (See Appendi 1). Students who do not complete the final stage may receive a Certificate of Higher Education (Level 4), Diploma in Higher Education (Levels 4 and 5) or a Bachelor degree without honours (Levels 4 and 5 and 60 credits at Level 6). A work placement is available between Phases 2 and 3.It is epected that all students will undertake the period of work placement unless they specifically opt out of the process. 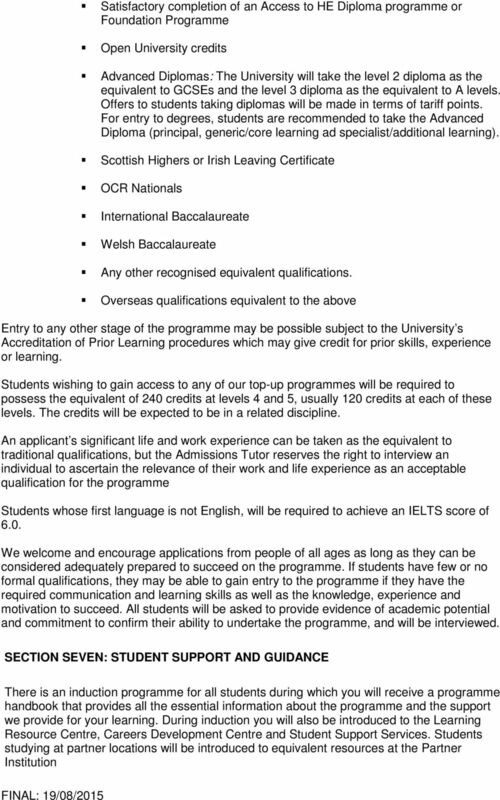 The placement will be for a minimum duration of nine months, during which time the student will be allocated a visiting academic tutor and have frequent contact with their Placements Officer. Obtaining a placement is a competitive process which requires a good deal of time and dedication on the behalf of the student. 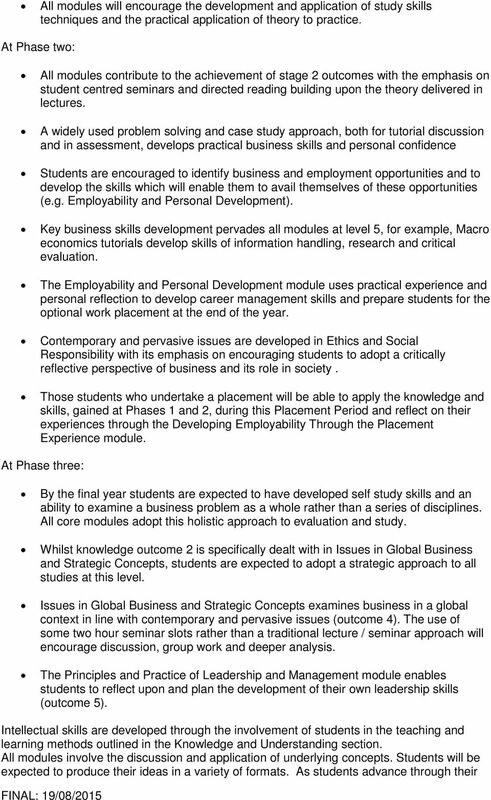 However, we will support you in this process largely via the second year module Employability and Personal Development. During this module, you will have etensive input from academics with epertise in employability as well as out award winning Careers Department and our dedicated Placements Officer. Students will be required to meet with their personal tutor on a frequent basis to review their placement applications and discuss personal career goals. 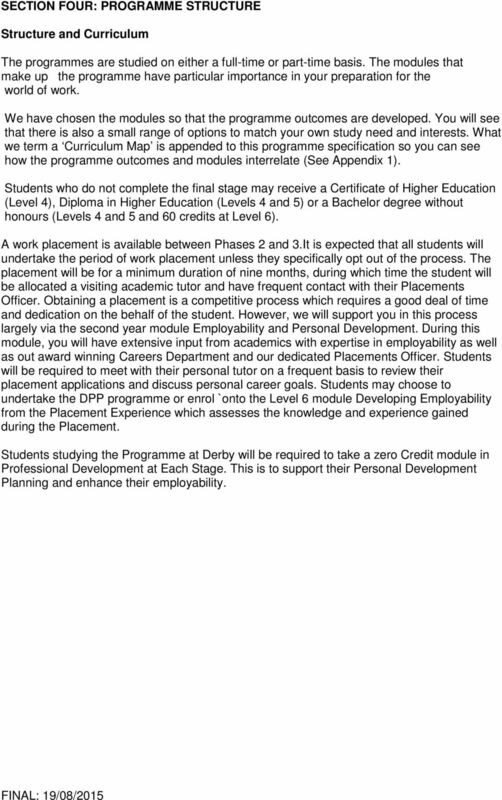 Students may choose to undertake the DPP programme or enrol `onto the Level 6 module Developing Employability from the Placement Eperience which assesses the knowledge and eperience gained during the Placement. 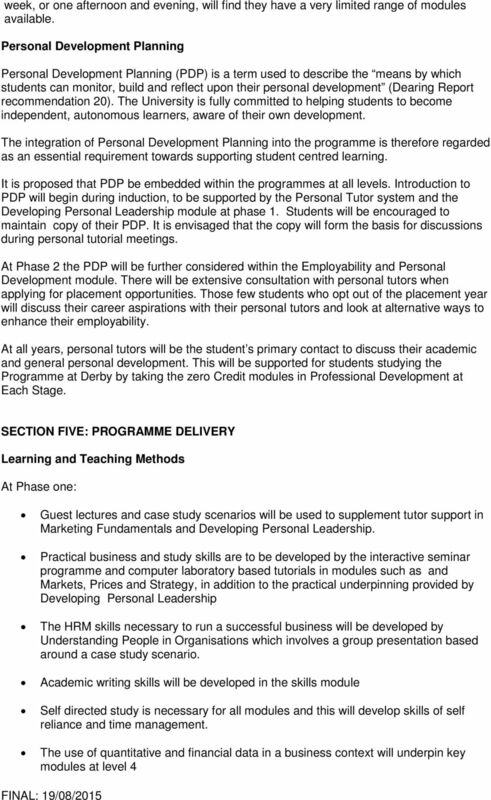 Students studying the Programme at Derby will be required to take a zero Credit module in Professional Development at Each Stage. This is to support their Personal Development Planning and enhance their employability. 18 The programme leader, assisted by personal tutors, oversees all students enrolled on the programme. Your personal tutor will monitor your progress on an individual basis. Module handbooks giving important information such as mode and time of assessment, plus plan of study, are issued at the start of the semester. There is also a wealth of information available on UDO. 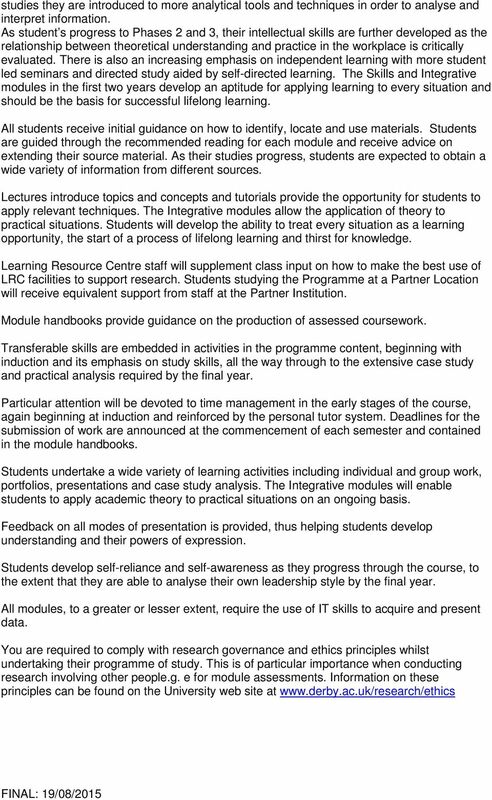 Advice is provided on module choice during regular meetings with the personal tutor. full-time Placement Officer will assist you to find an industrial placement with a suitable company should you decide to undertake a placement. The Placement Officer and visiting tutors from the University will also monitor your progress during your period of industrial placement. The University central Student Support Services offers a range of general, specialist and professional support services for students as detailed in your programme handbook. Equivalent support services will be offered at Partner institutions. 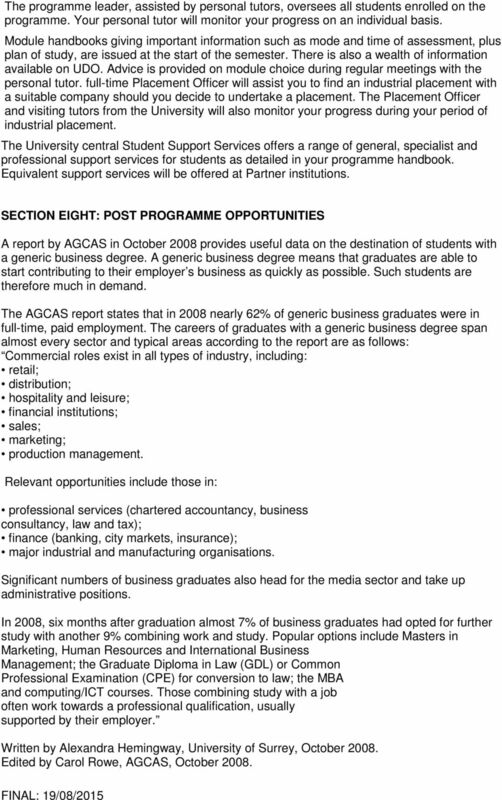 SECTION EIGHT: POST PROGRAMME OPPORTUNITIES A report by AGCAS in October 2008 provides useful data on the destination of students with a generic business degree. A generic business degree means that graduates are able to start contributing to their employer s business as quickly as possible. Such students are therefore much in demand. The AGCAS report states that in 2008 nearly 62% of generic business graduates were in full-time, paid employment. The careers of graduates with a generic business degree span almost every sector and typical areas according to the report are as follows: Commercial roles eist in all types of industry, including: retail; distribution; hospitality and leisure; financial institutions; sales; marketing; production management. Relevant opportunities include those in: professional services (chartered accountancy, business consultancy, law and ta); finance (banking, city markets, insurance); major industrial and manufacturing organisations. Significant numbers of business graduates also head for the media sector and take up administrative positions. In 2008, si months after graduation almost 7% of business graduates had opted for further study with another 9% combining work and study. Popular options include Masters in Marketing, Human Resources and International Business Management; the Graduate Diploma in Law (GDL) or Common Professional Eamination (CPE) for conversion to law; the MBA and computing/ict courses. Those combining study with a job often work towards a professional qualification, usually supported by their employer. Written by Aleandra Hemingway, University of Surrey, October Edited by Carol Rowe, AGCAS, October 2008. 19 SECTION NINE: EMPLOYER LINKS A number of employers have been consulted during the early part of the validation process to establish what skills they were looking for from business graduates. Once the programmes had been designed, representatives from all realms of industry as well as professional bodies such as the Chartered Management Institute have commented upon the design of the programme. Guest speakers will be an integral part of the programme once delivery begins, and case studies will be provided by real organisations. The opportunity to attend branch meetings of the CMI, where possible, and the consequent possibilities for networking will be an added benefit of CMI membership. In addition, CMI membership allows students to have access to the etensive CMI library facilities containing enormous numbers of up to date, relevant business literature. 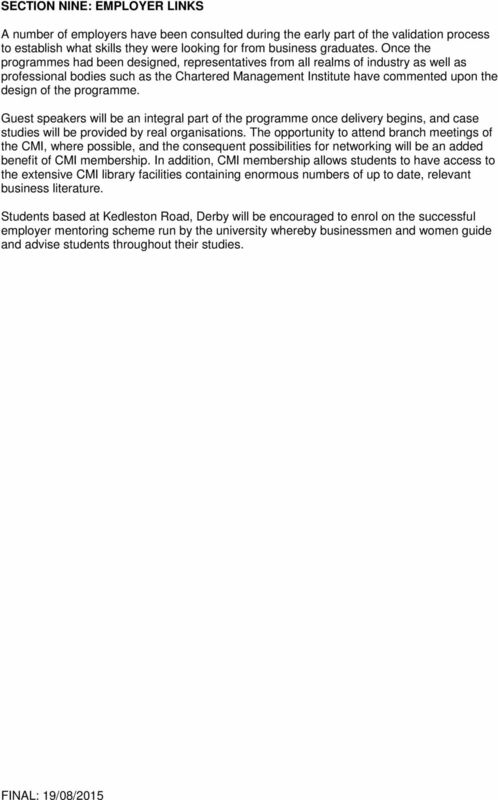 Students based at Kedleston Road, Derby will be encouraged to enrol on the successful employer mentoring scheme run by the university whereby businessmen and women guide and advise students throughout their studies.